This won't be one of those long technical reviews. You're reading this to make sure that the Amazon Kindle Fire you already know you want is up to snuff, and well, it is. I've had it since Thursday — reading, watching video, listening to music, checking email, even playing some games — and I can say it's tight. Turn it on and you know what to do, like with an Apple product. So much like an Apple product that Apple should be scared. It's a 7-inch tablet, which means that it's half as big as an iPad, and way closer in size to a paperback book. It could be a little easier to grip, but Amazon went minimalist here, rather than opting for some weird-looking ergonomics. Because of the size, reading is easier than on an iPad, though kids' entertainment and other engrossing interactive content isn't as fun. And because the Fire is widescreen, unlike the more 4x3 iPad, videos look almost as big as they do on Apple's much larger device. As far as screen quality goes, it's on par with the iPad. In other words, as an opening move, hardware-wise, Amazon's getting it right. If you buy the Fire from Amazon's website, it comes with your login information already onboard, so you just confirm that you are you, and you're off. The top of the home screen has labeled categories: Newsstand, Books, Music, Video, Docs, Apps and Web. Any Kindle e-books you ever bought show up in the library archive, any music you bought or uploaded to Amazon's Cloud Player shows up in music, and any video in your locker is there, too. There's a gallery of apps that you may have purchased from Amazon's app store (excuse me, "Appstore"). And by design, each page of stuff you own is just a click away from a store where you can get a ton more. Amazon's Appstore is a huge asset. Because it is tied to Amazon's own purchasing system, it's easier for you to buy apps from a trusted source. And because Amazon went with quality over quantity, it lacks the feel of Google's Android Market, which can get so slimy that it could use a hosing down from time to time. Not every app you want is in the Amazon Appstore, but the company is already getting some of the best stuff out there — including apps from competitors like Netflix and Hulu — and developers who see the Kindle Fire will work just as hard to get their "A" material in front of Fire buyers. The rest of the home screen is a combination of two well-known Apple design elements. Up top, there's a "cover flow" of all recent items, be they book, app, movie or Web page. Underneath is an iBooks-like shelving system, where you can pin and rearrange your favorite media items. Rip-off or not, the interface works well enough. The Fire is certainly more fluid than the Kindle e-reader, which succeeds in spite of its user interface. Speaking of fluid, the Fire's Silk browser is nice and quick, and only gets faster as it wises up to your browsing patterns. If you always hit the msnbc.com home page then jump to Tech/Sci, it will start caching Tech/Sci in anticipation of your click. And though it tends to trigger the mobile versions of websites, it has few problems with the full versions, including embedded video and other features. I did encounter a broken page once, apparently caused by an ad loading funny, but troubles have been minor to date. It's easy to see that Amazon Prime will be a requirement for most Fire buyers, and not only because it's the best way to get Julia Child's original series "The French Chef" instantly on demand. Prime videos, movies and books could account for a huge chunk of your media diet, and represent the best value. It's a shame Amazon doesn't have a Spotify-like component for on-demand music, but I suspect that would eat too much into its MP3 sales. The biggest downside to Prime video is that it's like Netflix, and only works when you're connected to the Internet. That means that, in an airplane or a car, you are likely in trouble. You can connect the Kindle Fire to your PC or Mac and easily copy over home videos and movies you rip from DVD (DVDs you own, hopefully). Still, the main way to take videos with you into a no-bandwidth zone is to rent or buy them, so you can download them to the Fire. Beware, because with a total of 8GB on board, you only have enough storage for 10 movies or 800 songs, but certainly not both. There's no step-up model, like there is with the iPad, and there's no SD card slot, like on the Barnes & Noble Nook Tablet. As you wander through the Kindle Fire interface, it's not easy to get lost, partly because the categories are so cut-and-dry, and partly because you can nearly always see a home button to take you back when things get muddy. But I say "nearly" because in some apps, you have to click a few times to even see the home button. This inconsistency made me miss the physical home button found on the iPad and many Android devices. While we're on the subject, I also missed volume up/down buttons, and wish that the on/off button wasn't located on the bottom, where it's so easily pressed on accident. But these are design issues that don't really interfere with the overall potency of the product, especially since much of the potency comes from that $199 price tag. What does matter is battery life. Amazon says it's "up to 8 hours of continuous reading, or 7.5 hours of video playback, with wireless off." That's not as good as an iPad, which is rated for up to 10 hours of continuous use. I didn't run it into the ground in one sitting, but I managed to go several days of regular use between charges. Again, an iPad can go longer — mine lasts nearly a week between charges. Still, the Fire's battery life ought to be satisfactory for most people. So while we're on the subject of iPad, let's have the talk. 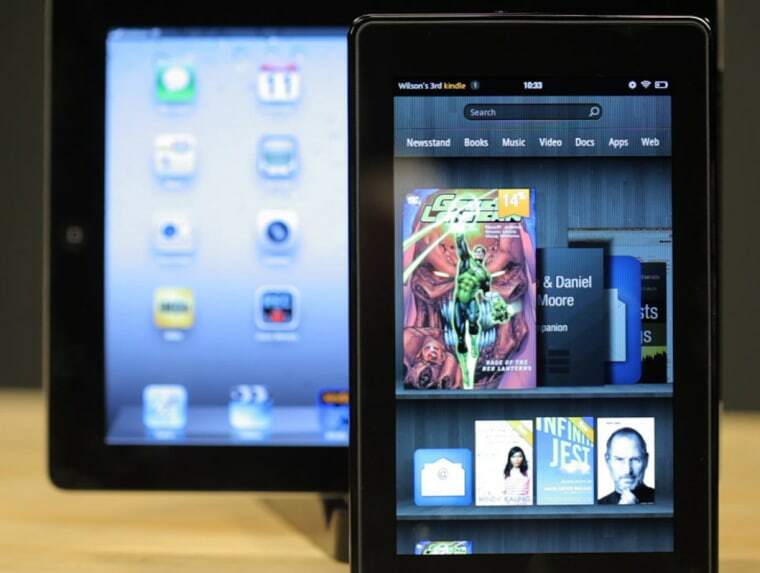 No, the Kindle Fire is not anywhere close to being the precision machine that the iPad 2 is. There are no cameras and no microphone. The Fire's screen is half the size of the iPad's, and the Fire's battery life isn't as good, yet the Fire is still a hair thicker. The Fire interface, while seductively simple, lacks the nuances — the futuristic animations and fades — that keep Apple on top. But for Apple, this still spells trouble. The Kindle Fire can handle about 80 percent of what I want to do on an iPad, for 40 percent of the price. And much of what's missing won't be missing for long. Even if you can justify buying one iPad, you may look to the Fire as a second device in your high-tech home. And if you can't justify an iPad this holiday season, you might consider Amazon's alternative. Later this week, we'll be looking at the Barnes & Noble Nook Tablet, the closest thing to competition that the Kindle Fire will see in its class and price range. Though Barnes & Noble already has momentum from selling the Nook Color, it's hard to see how the book retailer could outsell Amazon in this space, especially since Amazon is a digital media powerhouse, and these tablets are about more than reading. We keep an open mind, though, not least of all because the Nook specs are impressive. But for the moment, and perhaps for the time being, Kindle Fire is well worth its amazingly low price. Catch up with Wilson on Twitter at @wjrothman, or on Google+. And join our conversation on Facebook.